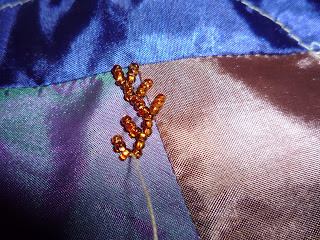 Several people had admired the beaded feather stitch that I enjoy using on seam treatments so I have decided to write up a little "how-to" on it. And since one picture is worth a thousand words I went a little crazy with the pictures! 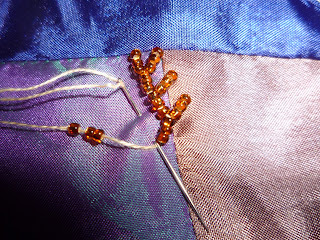 So, you will need a beading needle for this stitch , some seed beads and thread. I like using Fireline now for the security of it but since it shows up better in the pictures I have just used regular DMC (one strand). I have used the floss on this seam many times in the past with no problems. 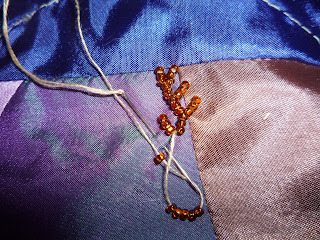 After securing your thread well on the back come up to the left of your seam and then thread six beads onto your thread. You can use more beads but the key is to make sure they are an even number (6, 8, etc). 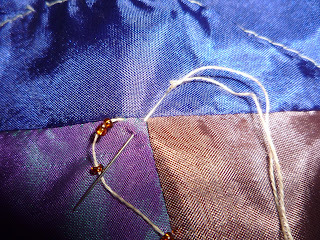 To complete the first stitch you put your needle down to the right of where you came up and then come back up at the halfway mark a bit lower. 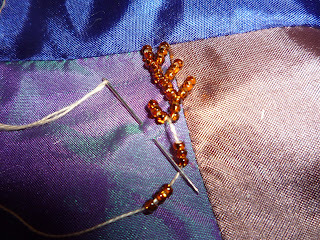 Pull your thread through and then hold it between the two center beads. This is why you need an even number. 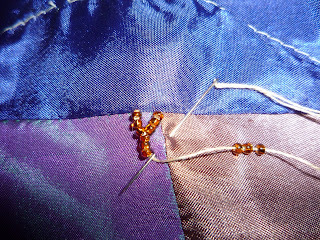 With three beads on one side and three on the other it keeps the "V's" nice and uniform. 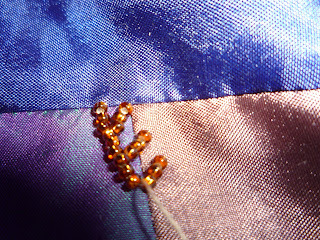 The second stitch is done the same way - after bringing the thread up and holding it in place in the center of the beads of the last stitch you thread on another six beads. Put your needle down directly to the right where you came up, go down to the right and come back up in the center below. 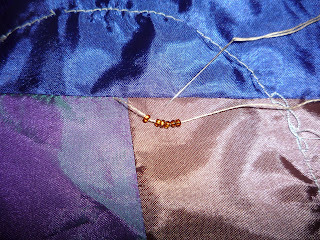 Pull your thread through and hold it down through the space in the center of the beads - three on one side and three on the other. Carry on the same way for the next stitch. You now have three stitches stepping down and to the right - time to start working back to the left. The next stitch is made in exactly the same way except you are moving downwards and to the left this time. After making two stitches downward and to the left you have completed this leg. Time to head back to the right again. Keep working back and forth in this way until you have a seam of the length you want. 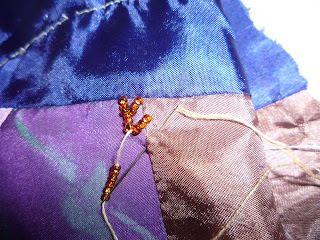 You will find it helpful to use your thumb to hold the thread between the beads as you make each next step to keep it laying in the center where you want it. 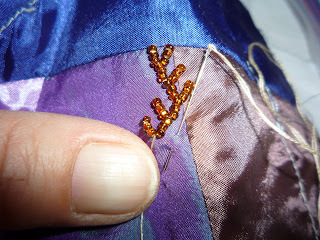 This beaded feather stitch also looks very nice when worked back and forth only one stitch instead of as shown here. The previous post that had been commented favourably on was in fact made using one stitch to the left, one to the right, one to the left, etc. 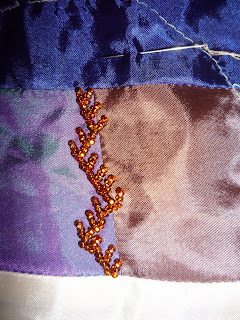 There are a lot of the basic embroidery stitches we use that can easily be adapted to bead embroidery - this is just one. Have fun! I've often wondered how this stitch was worked. Thanks for the instructions. I'll try it soon. WOW, Susan, you always make everything look so easy! Thank you for the wonderful tutorial. Now I'm no longer afraid to try this. I'll have to try that when I'm feathering something again. Thanks!